Just How Unsustainable Are The Meat And Dairy Industries? ​If you have not yet checked out the Cowspiracy documentary then I highly recommend it. One of the biggest ways to slow down the effects of global warming is being ignored. Unless we address this issue then everything else we do will likely be in vane. Here is their infographic to give you a quick summary. This groundbreaking feature-length environmental documentary following intrepid filmmaker Kip Andersen as he uncovers the most destructive industry facing the planet today – and investigates why the world’s leading environmental organizations are too afraid to talk about it. Animal agriculture is the leading cause of deforestation, water consumption, and pollution is responsible for more greenhouse gases than the transportation industry, and is a primary driver of rainforest destruction, species extinction, habitat loss, topsoil erosion, ocean “dead zones,” and virtually every other environmental ill. Yet it goes on, almost entirely unchallenged. Check out the trailer to the documentary below (or better still, see the full thing on Netflix). Want to get more from your digital marketing? Then try our (rather in-depth but easy to follow) training course. 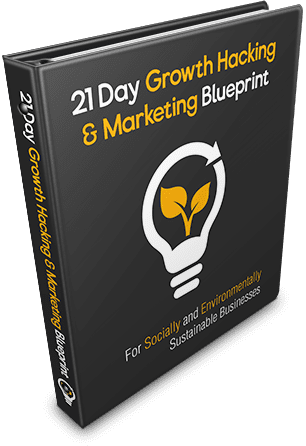 By signing up to this course, I promise to use these business and marketing growth hacks only for developing a business that aims to make a social and environmental difference.